Fort Wayne's beloved Wayne Candies started life in 1902 as the confections manufacturer Heit-Miller-Lau Company so named after the founders' three names: Anthony Heit, Joseph Miller and Thomas Lau. The company made a number of different candies including the Mary Wayne and Lady Wayne Chocolate's brand (named after Mary Penrose Wayne, General Anthony Wayne's wife) and sold to drug, variety, and mom and pop grocery stores throughout the area. In 1930 ownership of the company changed hands from the three founders to W. Charles Dickmeyer who had joined the company in 1919, and for years previously had been the sales manager for Perfection Bakeries. That same year Dickmeyer changed the company name to Wayne Candies. While they had made "nut clusters" along with a host of other candies they either sold in white bags or boxed with the chocolates in brown paper holders (much like Wittman's Samplers today), in 1947 they copyrighted Vanilla Cream Bun and the Bun Bar as we know it was officially born. By 1957 the Bun Bar was popular enough that it began to appear in retailers' newspaper ads and the brand was off and running. In 1967 the company was issued a trademark for the advertising slogan "It's Fun To Eat A Bun" which had been developed by well-known local advertising agency executive Louie Bonsib. The company had several locations over the years beginning at 1131 South Calhoun, then 113 East Jefferson and finally moving into the old American Fork and Hoe plant in 1950, which had been built in 1905 for the National Handle Co. and still stands to this day at 1501 East Berry, a block west of Anthony. In 2009 Brian Schaper/Metro Realty purchased the old Wayne Candies plant and has refurbished and given it a facelift in part with a City of Fort Wayne Commercial Facade Grant. The resulting building renaissance now houses a number of businesses including Summit City Brewerks and Anchor Films. After Dickmeyer died in 1968, his family sold the company (a process he had initiated) and his son Richard Dickmeyer opened Key III Candies (he and two other "key" people founded it) along with Frank Hawker and Charles Nartker in 1973 on Earth Drive at Engle Road which operated until 2012. 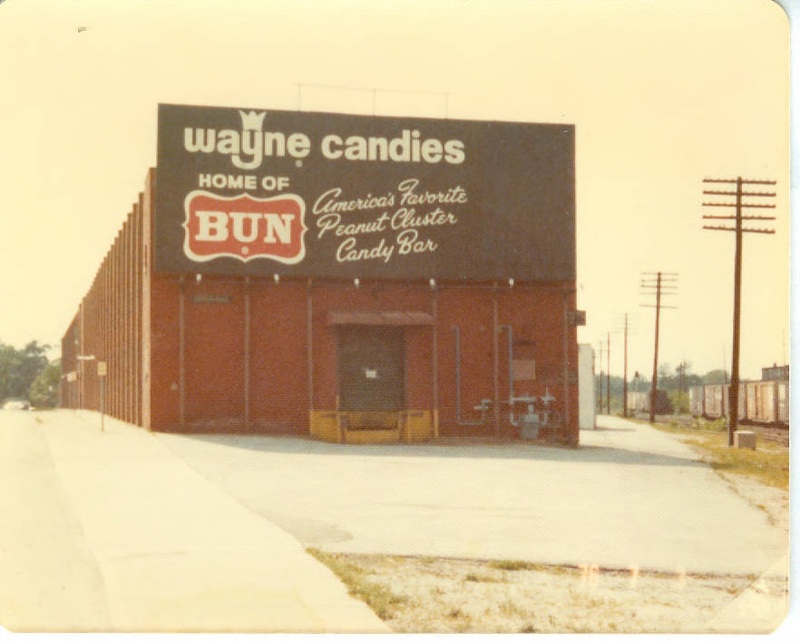 In the meantime, Wayne Candies and its Bun Bar brand was owned by a number of large confection companies. The first outside owner was the Leaf Confectionary division of W. R. Grace (Whopper's Malted Milk Balls), who then resold in 1974 to the Curtiss Candy division of Standard Brands (Baby Ruth and Butterfinger). It was while Standard Brands owned the company in the late 1970s that the Reggie Bar (essentially a repackaged Caramel Bun Bar) named after baseball player Reggie Jackson was made in the Fort Wayne plant. Standard Brands later merged with NABISCO in 1981 and they then sold Wayne Candies to the German firm Storck USA, makers of Werther's Original, who later divested of it in 1992 to Pittsburgh Food and Beverage, owners of the Clark Bar and Slo Poke brands. It is they that then shuttered the local plant for good and moved production to Pennsylvania in 1995. A scant three years later in 1998 Pittsburgh Food and Beverage went bankrupt and the brand was picked up by Pearson's Candy Company of St. Paul, MN, makers of Bit-O-Honey, Coconut Patties, Mint Patties, Nut Goodie, and now Bun Bars still deliciously manufactured in Vanilla, Maple and Caramel. By Randolph Harter for Fort Wayne Reader, January 19, 2017. Randy Harter is a Fort Wayne historian and author of two books on local history.